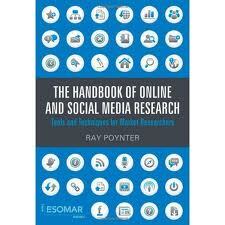 Earlier this year Ray Poynter, market researcher and blogger, published his book "The Handbook of Online and Social Media Research". Many market researchers have taken to blogging but it is good to see something go into print. I recommend this book in every market researchers office as it is a great resource and as the title says it is a handbook. The book covers a wide range of research methodologies and issues in the new world of online market research and social media. Wondering about online qualitative research, the use of twitter in market research? This book is where to start. Market research embracing social media is still in it's infancy and destined to grow and develop. This book provides a good marker of where it is today and will surely be used as a reference five and ten years from now as we look back on how it has revolutionized the industry. Pick it up at Amazon.